The Arts and Industries Building and surrounding gardens, where I worked from 1973 to 2006. The Arts and Industries Building, originally named the U.S. National Museum building, was the first building built to be the national museum of the United States. I love its beautiful 19th century architecture, the Haupt and Ripley gardens that border it, and the sound of the carousel on the Mall in front of it. July 5, 1850, the day that Spencer Fullerton Baird was hired as Smithsonian Assistant Secretary in charge of the U.S. National Museum. Baird, my favorite Smithsonian employee, devoted his life to creating a great national museum at the Smithsonian. 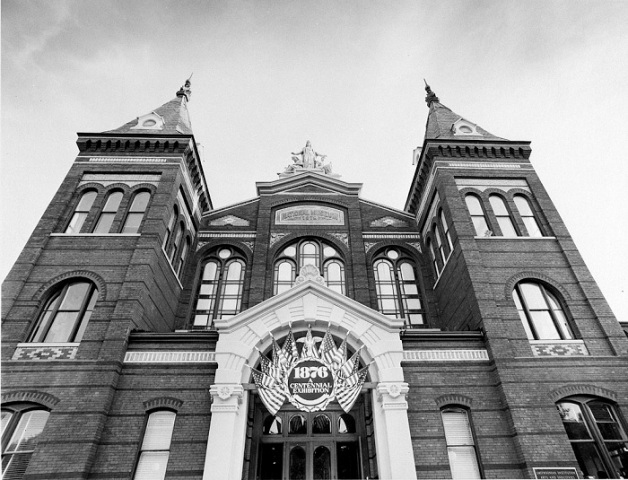 The Smithsonian Institution Archives is relaunching its exhibits program, which first began in 1984 in the Arts and Industries Building. For Volunteer Appreciation Week we take a look how this vital role at the Smithsonian has dramatically evolved over time. Leila Gay Forbes Clark, Director of Smithsonian Libraries from 1942 to 1957, was the second woman to direct the library at the Smithsonian. Dr. Robert McCormick Adams (1926-2018) served as the ninth Secretary of the Smithsonian from 1984 to 1994. An archeologist, he brought an understanding of human societies to his role as leader of the Smithsonian, instituting new educational and diversity programs.